It seems most people are either talking about “monolith applications” or “micro services”. But recently I’ve noticed yet another new buzzword bubbling up across the internet: “mini services”. It’s worth mentioning that this isn’t a post about which pattern is the most appropriate to use, as they’re all appropriate to use, when applied in the right context and scenario. To me “mini services” isn’t anything new, nor do I think it necessarily needs a new term to be applied to it. For me “mini services” are effectively just SOA (Service Oriented Architecture), but done right. Although maybe a new services lexicon † is useful, at least for giving a consistent and modern terminology to these concepts we collectively understand. † the vocabulary of a person, language, or branch of knowledge. Macro Service (Monolith Application): the traditional architecture model/system design. One big application handling multiple responsibilities and all of them plugged into a single data store. Mini Service (SOA): an evolution of the monolith where domain ‘boundaries’ were more clearly defined and made into separate services and data stores. Although these services would still handle multiple responsibilities, those responsibilties were at least related. Micro Service: we breakdown the domain boundaries even further so that services/data stores have very narrow and specific responsibilties. We’ve moved to ‘feature driven’ services. Nano Service: we go to the extremes of boundary definitions and are working at the ‘component’ level (BBC explain their approach to this here). 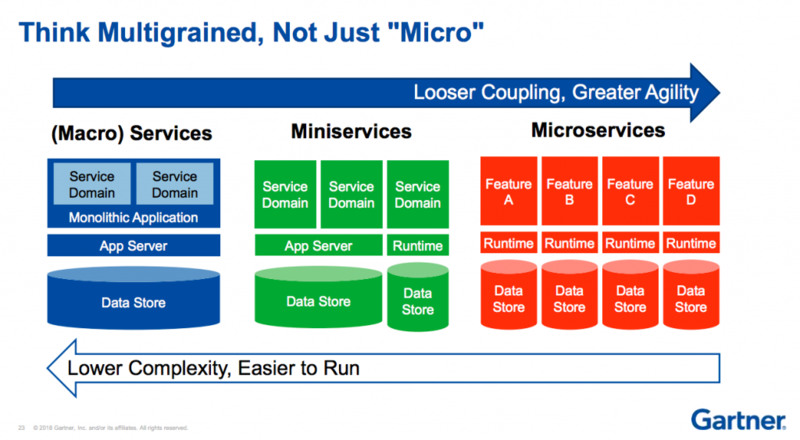 Micro services are themselves a new’ish concept at ~7 years of age (at the time of writing). The term was first used in 2011. But according to Ross Garrett (VP of Marketing Cloud Elements): “an HTTP-build service has to know more about what’s going on around it in order to communicate”. So how do we achieve communication without relying on tried and tested HTTP/REST APIs etc? The answer is the ‘observer’ design pattern (or pub/sub - publisher, subscriber model). With the pub/sub model, the micro service publishes notifications whenever something happens and services can subscribe to those notifications. This means the micro service has no awareness of anything outside of itself, it just throws out a notification and there’s either someone there to catch it and process it, or there isn’t. Queue systems like RabbitMQ or SQS etc are used heavily in these cases to allow for that decoupling. I tend to gravitate towards the SOA pattern † as it’s a nice balance between loose coupling and separation of domain boundaries without descending into the co-ordination and infrastructure madness of micro services. † or “mini services” if that’s the language you prefer, although I personally don’t think I’ll ever be able to bring myself to use it over “SOA”.